The Enoch Pratt Free Library Annual Book Sale is one of my favorite events of the year. The book sale is held the first weekend in December at the main branch of the Enoch Pratt on Cathedral between Mulberry and Franklin Street. The building alone is worth a trip with its beautiful architectural details, but we go for the books. The sale starts at 10am on Friday and runs through Sunday afternoon. In the main hall of the library they set up tables filled with books on every subject including, children's books, art books, travel books, fiction, non-fiction and a lot more. All paperback books are 50 cents and all hardback books are $1.00. To just put this in perspective we bought well over 30 books for $22.00. The sale itself is an experience, I always think of it like the Filenes basement bridal sale of books. People come with huge bins and carts and go home with hundreds of books. 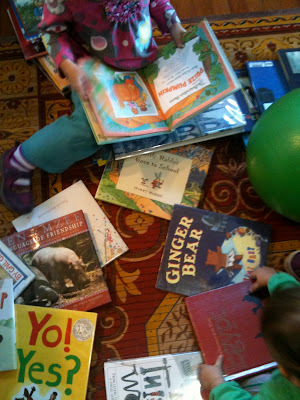 My most favorite part of the sale though is coming home, dumping all the books on the floor and checking out our haul. The girls and I spent a long time this morning looking at all our new books, so excited for some new reading! WHAT. I was there the day BEFORE this sale and had no idea about it :( I hope I remember next year somehow!